Looking for or need Transponder car keys or chip key in the Austin. Round Rock area? We stock and sell transponder car keys we can also cut and program transponder chip keys of many brands and styles. 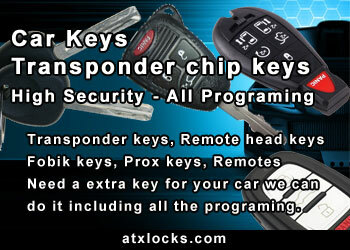 Chevy transponder keys, Ford transponder keys, Chrysler transponder keys, Dodge transponder keys and many more. We also stock many remote head keys for all the main car brands and have car remotes and fobic keys. Prox keys and more. We can come to you to cut your new key and then do the car key programming so you have a real working key to get you back on the road. We also do key Duplication and programming in of any extra keys as needed. We are your Austin transponder keys provider or Round Rock transponder key pro or Hutto transponder key seller and key programmer. Buy your keys from us no need to buy them on-line and pay extra shipping. Plus we can do the car key programming if needed and cut the key for you so it works for your car. For car key programming many things come into play some cars need a special pin code to be entered in before we can program in the key that is not a problem we can do it, Some cars like many older Toyota cars may not be able to be programmed easily they will require the computer to be removed and re flashed and then programmed that will cost more but we can do it for much less than taking it to a car dealer they will charge you well over $1000 for this and you will have to have your car towed to them we can save you time and money and no need to have your car towed as we come to you..